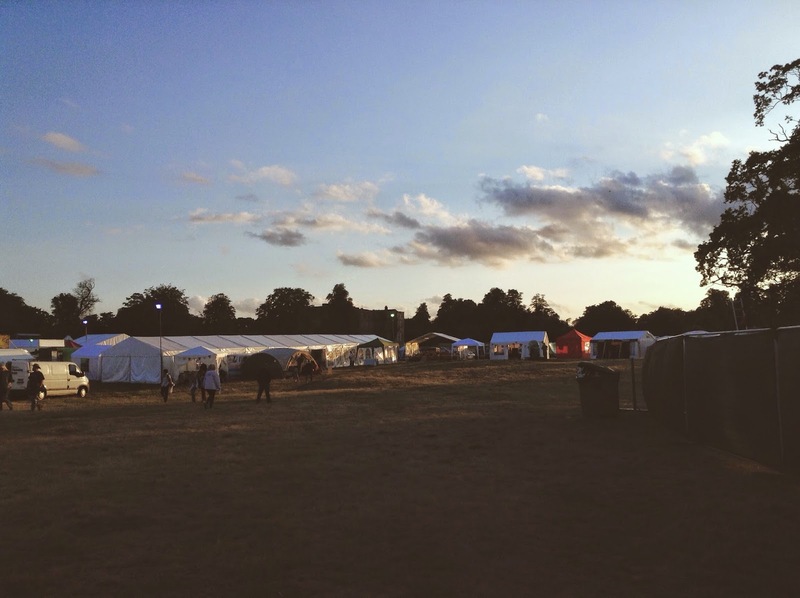 This year was the third FolkEast festival, set in the grounds of the magnificent Glemham Hall, Suffolk, for the second year running. I have attended this festival every year so far, as it is in my home county, and it never fails to bring joy. Midday, on Friday 15th August, we set off to this wonderful festival, not camping for the weekend (though that is definitely a desire of mine) but staying for the day. The rain which we had driven through failed to dampen our spirits and we arrived excited as ever, to soak up the long awaited FolkEast atmosphere. This festival somehow has the ability to seem very small and intimate and yet has so much to offer and explore. Arriving at a time when there was presently no music on the two main stages, we took the opportunity to explore the stalls of crafty and foody delights. Everyone was so friendly and we came away having printed our own FolkEast t shirts - a fine idea, I think you'll agree! We then headed to the Broad Roots stage to find it nicely full up with lots of people enthusiastically dancing to the sounds of The English String Band. The Soapbox stage is a big part of FolkEast, based in a cosy tent in the woods, showing off the wealth of local talent from the surrounding areas. We saw young singer/songwriter Tilly Dalglish play this stage, this time with multi-instrumentalist Finn Collinson. This was an absolute treat - Tilly has a beautiful voice, combined with her mandolin playing and Finn's talent over various instruments, it made for a fantastic set. Next up we saw the John Ward Band play the Broad Roots stage. Now, I have seen him play before - a fantastic local musician and singer/songwriter, but I had never seen him play with his full band. We were not disappointed. They played a mixture of classic traditional songs, for example Byker Hill and then some written by John as well. Almost all followed a nautical theme reflecting their passion for the East Anglian coast's heritage. We caught the end of The Rails after seeing John Ward and I wish that we had been able to see the whole set. They were excellent, taking a more folk rock approach to the music - their debut album 'Fair Warning' is out now and definitely worth a listen. 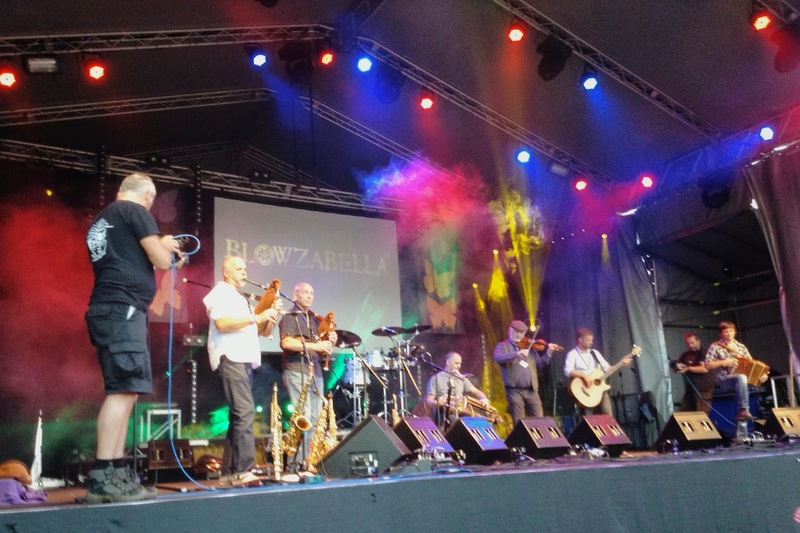 Now, before this day, I had not listened to much Blowzabella at all, so we approached seeing them through a veil of mystery. They are all exceptional musicians and played some incredible tunes, many written by them, they sang some traditional songs as well. As the sun was setting over Glemham, crowds assembled and much dancing was taking place. I absolutely loved them and would definitely take up an opportunity to see them again, if one arose. 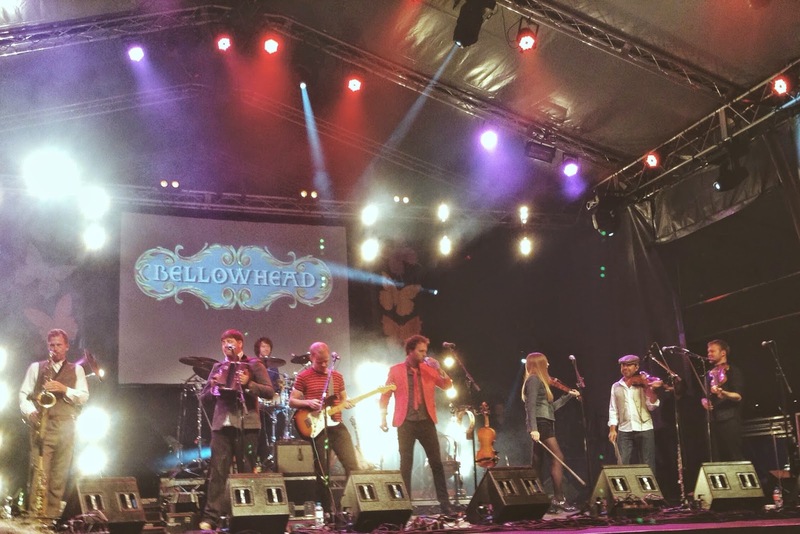 Finally, the name that was on every man, woman and child's lips; Bellowhead. We spent the hour before Bellowhead's set among other passionate fans, with the atmosphere of anticipation building. By then, the sun had well and truly set and everyone was eagerly awaiting them to finish the (actually rather intriguing) setting up process. The set was, as expected, absolutely fantastic - so entertaining and energetic. They played quite a few tracks from their latest album "Revival", opening with 'Let Her Run'; some maybe less well known ones such as 'Fakenham Fair' and 'Hopkinson's Favourite'; and some of the old classics including 'Sloe Gin' and 'New York Girls' - those ones that get literally everyone prancing madly around (dancing in some shape or form). What I'm trying to say is that FolkEast is an incredible festival, getting better and better every year. We had a brilliant time and will definitely be back next year. Ange Hardy - "The Lament of the Black Sheep"